So we were challenged by Mari at Marinik's Blog to reveal 10 things you need need to know and so we shall. The wine is flowing, the chocolate was flowing until we truffled it all, we're in the Blue Room. Life..is...good. 1. Jamie Oliver is a pillock. After extensive debate this is now an accepted truism, although equally there is general agreement that his books rock. 2. You'd better go to the loo before leaving the house in case there is a 'secret wee' lurking up there. 3. Jelica can't handle tunnels or salad related food items. Fact. 4. A gaggle of Nikons and the occasional lonely Canon will surprisingly attract the attention of locals and cause them to SPEAK to you. 5. Spud is incapable of turning up on time for Blog Camp. 6. Axes are surprisingly absent from Blog Camp although 'the husband' extensively searched the neighbourhood for a chain saw today. Fortunately without success. 7. Anne is pronouned Anna. She does not expect to be addressed as Miss Buckle. 8. Horizontal rain focuses the mind and legs for jump shots. 9. 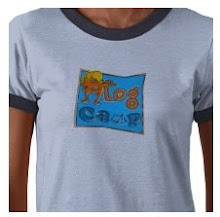 Dull but true...blog campers are JUST like their blogs. This is good! 10. You're either a Top Dog or a Mad Cow. Oh, Berlin! So we can meet "the other" Kristina! Why can't I be a top cow???? ?